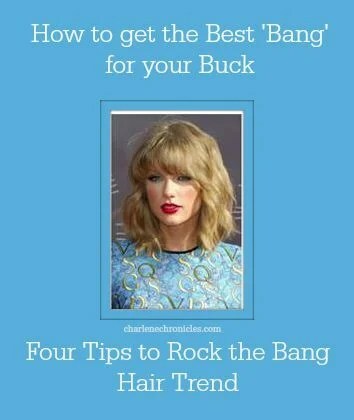 How to get the best ‘Bang’ for your buck. If you have been perusing any of the celebrity websites or watch any of the red carpet events, you probably noticed what I have noticed – Bangs! Lots of hair bangs on the female celebs. It is a hot trend and many stylists are getting requests for the chop, because it’s super fashionable right now, and can give a dramatic change to your look without drastically changing the length of your hair. However, if you want to jump on the ‘bang-wagon’, there are four tips you need to know from leading stylist, Ricky Pennisi, king of curly hair and founder of RI CI products. For square faced clients, Ricky always cuts heavy bangs as they soften the face and create a dramatic look that focuses on showcasing the eyes. Ask your stylist to make the hair on the forehead more feathery and longer on the sides near the temples. The bangs should hit just below your eyebrows, but shouldn’t touch your eye. This is also a great look for clients with a larger forehead. For round faced clients, the right bang cut can actually give the illusion that the face is longer. The bangs should be graphic, thick and hit just above the eyebrows. For heart-shaped faced clients, bangs should focus on making the top feel less heavy. Here is where Ricky prefers to do a great side swept bang. He also prefers a side bang for clients with smaller foreheads. This creates an illusion that their forehead is a bit longer without feeling too heavy. Depending on where his clients naturally part their hair is the side he chooses. With any cut, it’s important that it is easy to style after you leave the salon. For oval faced clients, this is when Ricky Pennisi really has some fun. Nearly any type of fringe that hits right below the brow bone accentuates this shape face and gives a feminine feature. So take note of these tips when you visit your local stylist! And your look will be Bangin’!